(Nanowerk News) A research team consisting of Osami Sakata, the director of the Synchrotron X-ray Station at SPring-8, Research Network and Facility Services Division, NIMS; Professor Hiroshi Kitagawa, Graduate School of Science, Kyoto University; and Professor Michihisa Koyama, Inamori Frontier Research Center, Kyushu University, made the first observation of the electronic structure in silver-rhodium (Ag-Rh) alloy nanoparticles to investigate why the alloy possesses a hydrogen absorbing/storage property like palladium (Pd) does, given that bulk Ag and Rh do not form an alloy, and that neither element alone is a hydrogen absorbing/storage metal. It is expected that these results ("The valence band structure of AgxRh1–x alloy nanoparticles") will further promote the creation of novel functional materials through the fusion of different elements, a technique likened to modern-day alchemy. Comparison in photoemission spectra between Pd nanoparticles and Ag0.5Rh0.5 alloy nanoparticles using high-brilliant synchrotron radiation. (a) Valence band spectra generated by applying high-brilliant synchrotron radiation to Ag0.5Rh0.5 alloy nanoparticles (dotted red line) and Pd nanoparticles (solid black line) in the binding energy range of 0 to 15 eV. The intensity for Ag0.5Rh0.5 alloy nanoparticles was about the half of that for Pd nanoparticles. (b) Valence band spectra for Ag0.5Rh0.5 alloy nanoparticles (dotted red line; its spectral intensity profile was elevated to overlap with that of Pd) and Pd nanoparticles (solid black line) spotlighting the binding energy range of 0 to 3.5 eV. Dotted blue line indicates the difference between the elevated spectra for Ag0.5Rh0.5 alloy nanoparticles and the spectra of Pd nanoparticles. EF is the Fermi energy. In the periodic table of elements, Pd is located between Rh and Ag, two elements incapable of absorbing/storage hydrogen. Bulk Ag and Rh are unable to form alloys. Only when these elements are arranged to be about 10 to 20 nanometers in size, they are capable of forming alloys, and Ag0.5Rh0.5 alloy nanoparticles with a 1-to-1 Ag-Rh content ratio store hydrogen like Pd does. However, it had been unknown why Ag0.5Rh0.5 alloy nanoparticles possessed such an unexpected property. It is critical, in terms of gaining fundamental knowledge in material development, to experimentally and theoretically understand the electronic structure of Ag-Rh alloy nanoparticles, which is believed to be closely associated with the hydrogen absorbing/storage property. The research team examined the electronic structure of the valence band in Ag-Rh alloy nanoparticles by taking measurements using high resolution photoelectron spectroscopy that emits high-brilliant synchrotron radiation and by conducting theoretical calculations. It is extremely difficult to examine the internal electronic structure of the particles that are about 10 to 20 nanometers in diameter by taking measurements in the laboratory equipped with photoelectron spectroscopy that emits (soft) X-rays with low energy. Therefore, we used (hard) X-rays at the NIMS’s beamline housed in the world’s largest synchrotron radiation facility (SPring-8). In addition, we accurately interpreted the results of the experiment based on calculated spectra which is proportional in electron density of states. Consequently, we found that Ag-Rh alloy nanoparticles are not merely a mixture of Ag and Rh at a microscopic level, but are a merging of the two elements at the atomic level, and that their electronic structure is nearly identical to that of Pd. 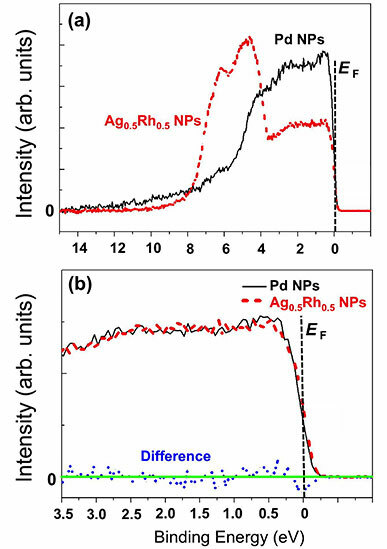 The fact that Ag-Rh alloy nanoparticles absorb hydrogen appears to be related to the similarity in electronic structure between the Ag-Rh alloy and Pd. These results indicate that Ag-Rh alloy nanoparticles are not only capable of absorbing/storage hydrogen due to their electronic structure, but they also may serve as a useful catalyst. In the future, we are planning to advance joint research on characteristics and physical properties of the material. In addition, we intend to provide data on electronic structures and atomic arrangements to industries so that they can take advantage of various new functional materials to be developed besides Ag-Rh alloy nanoparticles. Furthermore, we will establish a foundation to carry out research on design-based materials using proper data (materials informatics).